Conference Proceedings (papers, slides, and posters) are available on figshare. The Poster Session and Resource Expo will be a terrific opportunity for conference participants to connect with colleagues, learn about research, and talk with providers of various gateway-related resources (e.g., software, hardware, consulting services, etc.). There is no additional cost to attend. Refreshments will be served at this event. NOTE: a shuttle bus will provide transportation between the SDSC conference venue and the Sheraton LaJolla at 5:45pm for those who wish to drop off belongings at the hotel, and between the Sheraton and Faculty Club for the remainder of the evening. See the Conference Booklet for the complete schedule. The Reception ends at 8:30pm. Afterwards Informal dinner for those who are not leaving San Diego immediately after the conference. This is not included in the conference; you will be ordering from a menu. Please sign up near the registration desk so that we can advise the restaurant of how many people to expect. The Division of Advanced Cyberinfrastructure (ACI) seeks to encourage, support and incentivize its community to create a sustainable national scientific cyberinfrastructure ecosystem. In keeping with this intent ACI’s software programs seek to holistically promote **software-centric** ecosystems that are seen by stakeholder communities as their primary means of furthering and accelerating their science. These software ecosystems comprise reusable software components and frameworks along with a highly-capable workforce. This workforce both uses as well as contributes to this software thus sustaining the ecosystem. The Software Infrastructure for Sustained Innovation (SI2) program has been the flagship software program within ACI. This year, the SI2 program made major, multi-million dollar awards to establish two Scientific Software Innovation Institutes (S2I2) that will serve as long-term hubs for scientific software development, maintenance and education. The Science Gateways Community Institute (SGCI) is a multi-institutional consortium that will increase the capabilities, number and sustainability of science gateways — mobile or web-based applications that provide broad access to the nation’s shared cyberinfrastructure to scientists and citizens alike. This talk seeks to present an overview of ACIs programs, in particular its software programs, with a focus on the special role of gateways and the SGCI. About Rajiv Ramnath: Dr. Ramnath is a Program Director in the Software cluster at the Division of Advanced Cyberinfrastructure (ACI) at the National Science Foundation. He is also a Professor of Practice in Computer Science and Engineering at The Ohio State University where he has extensively collaborated with industry and other departments on research and education programs. Prior to this he worked for many years in industry, leading government-funded research and commercial product development. His industry R&D lab, almost unbeknownst to him, turned into a startup, so Rajiv ended up as an entrepreneur, and so, in addition to his academic work, he has also advised large and small businesses and startups on computing and information technology strategies. At NSF, Rajiv seeks to further the Software cluster’s mission of making scientific software an integral and sustainable part of the national scientific cyberinfrastructure ecosystem. The architecture of Jupyter provides a clean separation between the execution context (known as a “kernel” and available for over 70 programming languages) and the user interface; the two communicate via a well-specified, open protocol. Taking advantage of this design, we have built a web-based interface that exposes the computational capabilities of the kernels to users, requiring only a modern web browser. The main component of this interface is the Jupyter Notebook, a system that allows users to compose rich documents that combine narrative text and mathematics together with live code and the output of computations in any format compatible with a web browser (plots, animations, audio, video, etc.). In addition to illustrating the above foundations, in this talk I will discuss the next generation of the Jupyter web interface, JupyterLab. JupyterLab combines in a single user interface not only the notebook, but multiple other tools to access Jupyter services and remote computational resources and data. A flexible and responsive UI allows the user to mix Notebooks, terminals, text editors, graphical consoles and more, presenting in a single, unified environment the tools needed to work with a remote environment. Furthermore, the entire design is extensible and based on plugins that interoperate via open APIs, making it possible to design new plugins tailored to specific types of data or user needs. We believe this design is an ideal foundation on which to build modern scientific gateways that support a wide range of user scenarios, from interactive data exploration in high-level languages like Python, Julia or R, to the monitoring and control of traditional HPC resources. 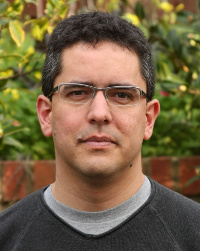 About Fernando Perez: Fernando Pérez (@fperez_org) is a staff scientist at Lawrence Berkeley National Laboratory and a founding investigator of the Berkeley Institute for Data Science at UC Berkeley, created in 2013. He received a PhD in particle physics from the University of Colorado at Boulder, followed by postdoctoral research in applied mathematics, developing numerical algorithms. Today, his research focuses on creating tools for modern computational research and data science across domain disciplines, with an emphasis on high-level languages, literate computing and reproducible research. He created IPython while a graduate student in 2001 and continues to lead its evolution into Project Jupyter, now as a collaborative effort with a talented team that does all the hard work. He regularly lectures about scientific computing and data science, and is a member of the Python Software Foundation as well as a founding member of the Numfocus Foundation. He is the recipient of the 2012 Award for the Advancement of Free Software from the Free Software Foundation. High performance computing processes and workflows often have several steps for example input preparation, computation monitoring, output validation, analysis and visualizations. All these processes yield small-scale consumable data such as computation progress, statistics, plots that are of high value for research team. Sharing and accessing this information by team members is often slow and cumbersome in current HPC environment. SeedMe platform lowers these barriers by providing cyberinfrastructure and necessary tools for data sharing. This tutorial will introduce attendees to the SeedMe (Stream encode explore and disseminate My experiment) platform and show how this platform can be leveraged to share data rapidly with easy to use tools in ad hoc and/or automated manner. We will also show how to create videos from set of images, which may be useful for sharing visualization results. Pre-requisites: Basic familiarity with command line tools like changing directory and executing commands. GenApp is a tool for rapid deployment of applications. GenApp builds fully functioning applications from collections of definition files and libraries of code fragments. Applications are built over a set of modules, each module performing some computation. GenApp can build to a variety of targets, including local GUI and web based applications. Principles of GenApp include facilitating ease of use by tool, framework and application developers, module wrappers and end users. GenApp is currently being successfully used as the generator of multiple production science gateways. In this tutorial, users will learn the basics of developing applications with GenApp and will create both GUI and web based applications running on a cloud resource over the same set of modules. Requirements: Participants should bring a laptop with an SSH client and modern web browser installed. Working knowledge of some text editor under linux is required, such as nano, vi or emacs. The instructors will arrange for students to have access to cloud based training accounts. Software engineering (SE) is concerned with developing and maintaining software systems that behave reliably and efficiently, and satisfy defined requirements. This tutorial presents an overview of SE, with a focus on security and science gateways. Some of the topics covered will include: software repositories, continuous integration, testing, code signing, vulnerability management, static analysis, and secure coding. CTSC (trustedci.org) and SGCI (sciencegateways.org) have partnered to help make science gateways more secure. Tutorial participants will get an introductory understanding of how security concerns are relevant to their gateways and how the partnership of the CTSC and SGCI may be able to help them. Requirements: Participants should bring a Mac or Windows laptop. Globus is an established service that is widely used for managing research data on XSEDE, DOE, and campus computing resources, and it continues to evolve with the addition of data publication capabilities, and enhancement of the core data transfer and sharing functions. Over the past year we have added new identity and access management functionality that will simplify access to Globus using campus logins, and facilitate the integration of Globus, XSEDE, and other research cyberinfrastructure services into web and mobile applications. In this session we will describe the Globus platform-as-a-service for research data management, and for identity and access management, and demonstrate how developers can use the Globus platform in portals, science gateways, and web applications to deliver advanced data and identity management capabilities to their research communities. A combination of presentation, demonstrations, and code walkthroughs will allow attendees to develop a good understanding of the platform’s capabilities and how it can be used in their own work. Requirements: It is recommended that participants bring a laptop with Python and Git in order to perform tutorial exercises. The Agave Platform is an open Science-as-a-Service platform that empowers users to run code, manage data, collaborate meaningfully, and integrate easily with the world around them. A common requirement of many projects, is to provide a single-purpose science gateway that allows project members to collaborate on computational experiments and publish data for external consumption. In this short tutorial, we walk attendees through the creation, branding, configuration, and automated deployment of a single-purpose science gateway based on Agave ToGo Micro Sites. At the end of the tutorial, attendees will have a fully functional, zero-maintenance gateway hosted free of charge. Requirements: Users should have at minimum, the following requirements in order to effectively participate in and complete the tutorial: A laptop with Git installed, GitHub account, Basic HTML competency. This tutorial will be split between Airavata and HUBzero. In Part 1 of this tutorial, we present SciGaP, which includes participation from the CIPRES, UltraScan, Neuroscience, and SEAGrid Gateways combined with the Apache Airavata middleware for managing jobs and data. Our goal is to show participants how to build and run gateways using both software and collected experience from some of the most heavily used XSEDE science gateways. Example tutorial material is available from https://cwiki.apache.org/confluence/display/AIRAVATA/XSEDE+2016+Tutorials. Requirements for Part 1: Laptop or mobile phone to follow along with the demonstration. In Part 2 of this tutorial, we feature HUBzero (hubzero.org), which is a powerful, open source software platform for creating dynamic web sites that support scientific research and educational activities. Used by communities ranging from nanotechnology, composite design, earth sciences, data curation, to healthcare, it is a proven framework for building a science gateway and a key part of many organizations’ cyberinfrastructure. The HUBzero platform provides an application framework for developing and deploying interactive computational tools. This tutorial will provide an overview of the HUBzero integrated cyberinfrastructure, describe communities actively using it, and demonstrate how to build a web platform to support collaboration, data sharing, and computation. Requirements for Part 2: Laptop. In order to expedite the install of HUBzero, participants will need to create an AWS Marketplace Account https://aws.amazon.com/marketplace/. When doing the HUBzero install, if you terminate the image right after the tutorial it will cost you nothing. If you leave it running it will cost roughly .03 cents a minute. Correction: The cost is $0.04 / hour $0.01 t2.micro EC2 Instance usage fees + $0.03 hourly software fee. If you have any questions, please email the instructor at eahillery [at] purdue [dot] edu. You can view notes taken during the Open Space discussions here. We invite you to think about topics that you would like to discuss with your colleagues. It could be a problem you face in your science gateway work, a question you have about gateway technologies, a discovery you’d like to share with others, or an idea that occurs to you during the course of the conference. There will also be two breakout rooms with a projector, for those who might like to offer a demo or impromptu presentation. There will be three 30-minute sets of concurrent sessions. Approximately 9 locations will be designated for these sessions, but additional sessions/topics may be added at impromptu locations (e.g., outdoors).